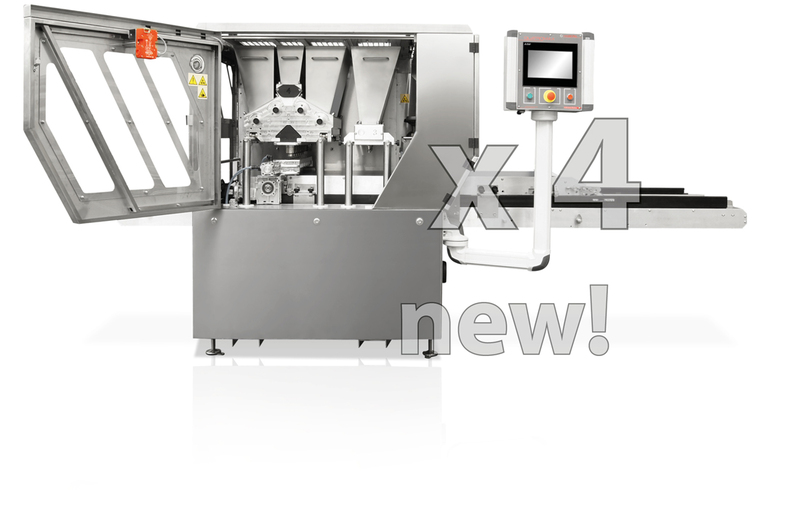 This is a top-class four-chamber machine for cake production! It has four heads, e.g. 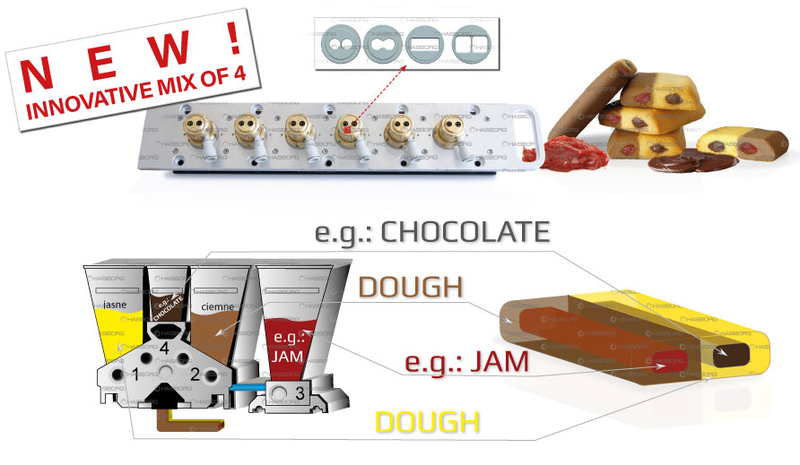 two for dark dough, two for dark and light dough, and two for filling, e.g. cream + marmalade, or two colours of marmalade. 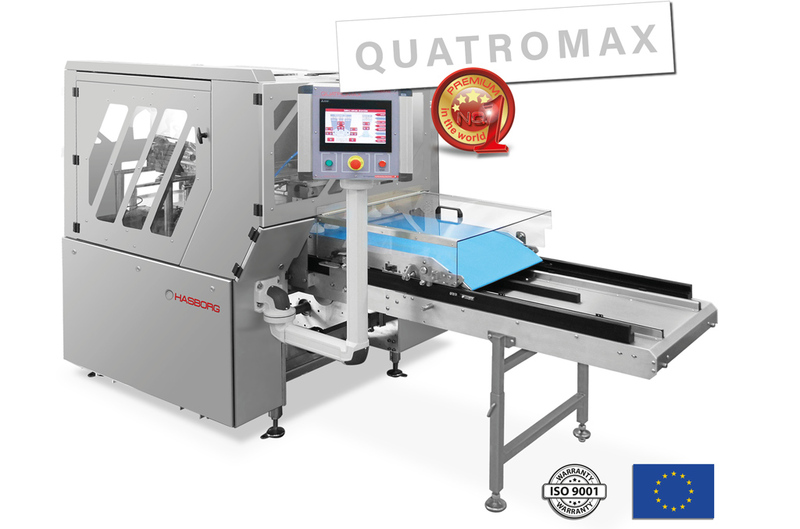 This is a top-class four-chamber machine for biscuits and cookies production! It has four chambers, e.g. two for dark dough, or for dark and light dough, and two for filling, e.g. cream + marmelade, or two colours of marmelade. This configuration makes it possible to produce a wide range of products of different shapes and lengths, e.g. : dual-colour with two kinds of filling, dual-colour with filling inside and a decoration on the top, triple-colour, cut with a string, sponge cake layers, cut with a guillotine with two types of filling, filled and cut with a shutter. As the only one of its class, it has a very diverse equipment, thanks to which, it is incredibly versatile and incomparable with other machines available on the market. It operates with the following types of dough: short pastry, choux pastry, gingerbread, sponge cake, muffins with filling and bits of fruit, meringue. Four innovative hermetic chambers. 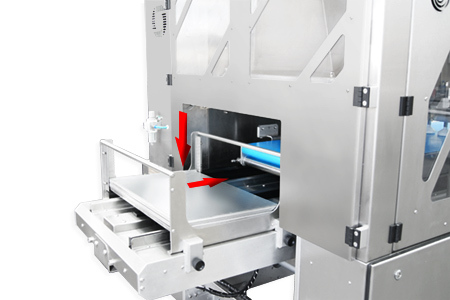 Automatic tray feeder with tray storage container. When the efficiency is high, it eliminates the necessity of having a second person‘s assistance to feed the trays. Triple head is made of one single block of aluminium in order to increase working stiffness, unlike the other machines offered on the market. Each roll is equipped with bearings; this solution protects the dough from overheating during the process of dough distribution. The whole structure is made of stainless steel. The two-column head lifting system is made on a cam basis. It does not require any lubrication, it works lightly and is trouble-free - digital adjustment of the lifting and lowering of the head (for the production of cookies of different heights). There is also a possibility to adjust the table. 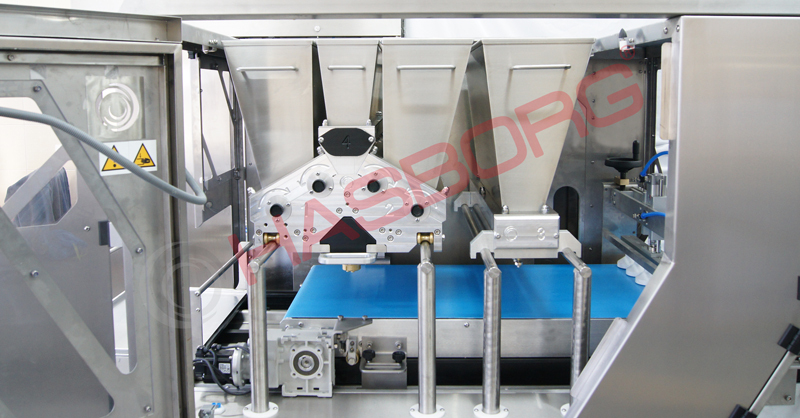 Dough leading slats and moulds with specially milled dough distribution channels reduce pressure in main head so the dough is passed more precisely to the forming nozzles. 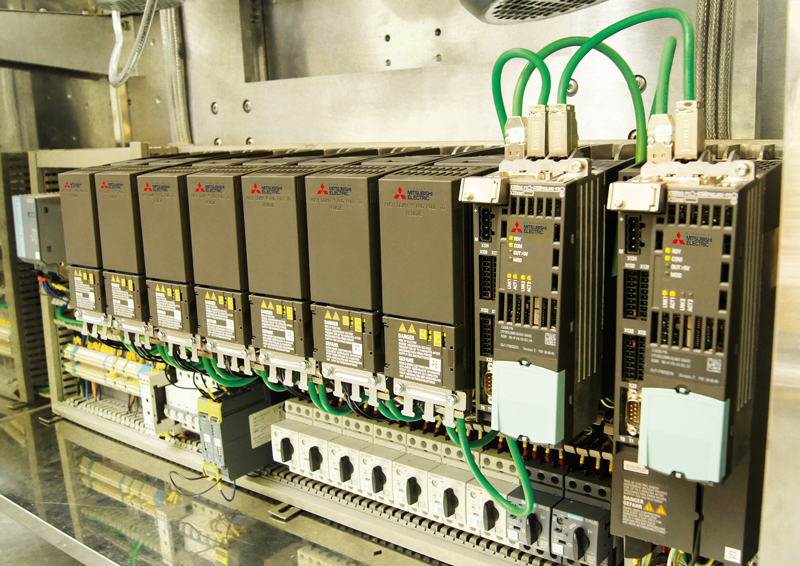 High performance and repeatability of the final product. Electronics and touch panel are simple and easy to use with multilingual menu. You can enter your own recipes and save them on the SD card. High energy efficiency. Innovative slat for chocolate / peanut and fruit fillings, a combination of two cakes and two fillings. One cake - four flavors. It enables the production of biscuits and cookies cut by the guillotine knife to the required length with or without the filling. This optional equipment is provided with a special control system, which gives you the possibility to set up the production parameters precisely, and it is very efficient – up to 500 kg of final product per hour. The option of a flattening roller allows you to produce additional shapes of guillotine-cut cookies. The roller is made of plastic and it is driven by a guillotine table belt. 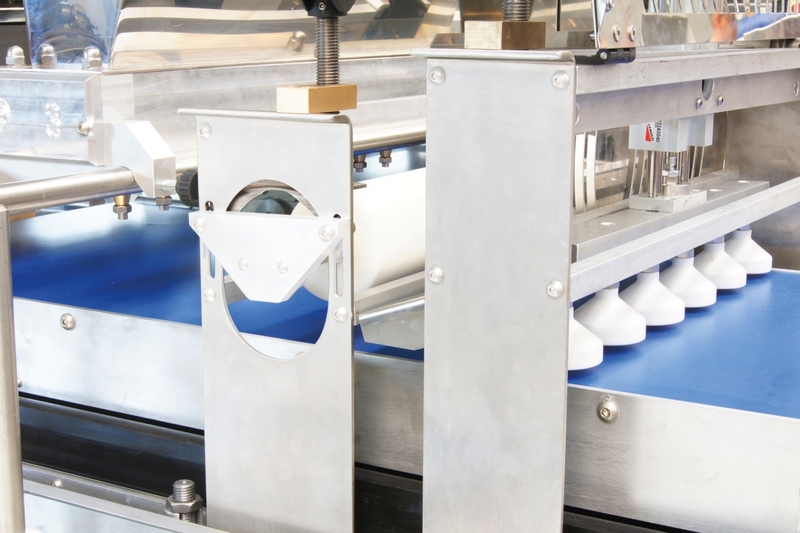 The roller option is dedicated to Hasborg products, such as Triomax or Duomax with an additional guillotine option. For Quatromax, the flattening roller has its own drive and adjustable clamping height.